Today I cut up an old, fallen oak tree for firewood. This tree had been dead for many years and was somewhat decomposed, but surprisingly to me, much of the wood was still quite sound. The wood fibers in oak have strong cell walls, making the wood resilient to decay. Besides this fact, much of this tree consisted of large branches with heavy knots, which remain firm even longer. My Dad and I worked in those same woods together almost thirty years ago, and that same oak tree had already fallen at that time. However, it was in quite an inaccessible place, and it was such a crooked and bent up tree, that we never did bother to go down where it had fallen to get it. In the past years, however, when I have been home in Wisconsin, I have been cleaning up that woods and making trails to get to places that we could not before easily go. 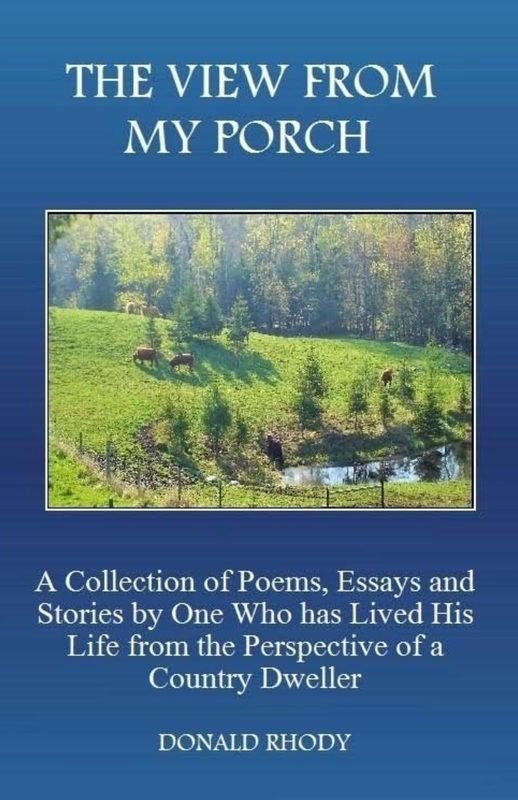 This year, in my gathering of firewood for the winter to come, I found myself looking once again at that old tree. As I stood there looking at the tree, it brought back some memories from when I worked in those woods with my Dad. Many of you know that my Dad passed away a little less than a year ago. I was in New Zealand and the time and unable to come home for the funeral. Because of this, if you would like to think of the poem below as a form of delayed mourning for my Dad, I think that your thoughts might be quite appropriate. Old, dried and knotty, nearly forgotten oak. Old, never forgotten, but now departed folk. Lying on the ground in front of me. When we logged there together, my Dad and I. Broken from its stump by a strong west wind. We left it lie; it had no wood we could sell. But now thirty years later, it had a story to tell. It spoke of the old days. It told me about my Dad. It said he did the very best with all that he had. Each generation must live in its own days. But with what he was given, my Dad did his best. He accomplished his work before he lay down to rest. But mostly in memories, some really quite clear. And I still am learning some things a son aught to know. I bent to inspect the knots of the wood. Though dead thirty years, some were really quite good. For a fireplace fire, the best wood often is old. It still contains power to drive out the cold. Into lengths that would fit in my fireplace box. I will burn that old oak, and remember my Dad. understanding of the concept of time. And it is not only this. In the last days especially, we see an interaction of time with eternity, which even further complicates our understanding. Eternity is, after all, a concept that is completely outside of our intellectual ability to understand. What we see in the book of Revelation is a melding together of the temporal with the eternal, or perhaps a transformation from one into the other, and this is completely outside of our experience. Because there is a sense in which time is related to eternity, it is at least partially because of the fact that we are unequipped to grasp the fullness of eternity that we cannot even completely understand the movement of time. It is also because of this condition of our inadequate understanding that we do well not to be excessively inflexible when forming opinions about the predicted events of the last days. However, there is value in trying to come to an understanding of the events contained in time and in history. As I mentioned in my book, Watching for the Day, the most fundamental teaching of Jesus concerning the last days is that we remain watchful. It is the very act of trying to understand how future events unfold that will keep us watchful. Something that will help us in this task of understanding is to come to a realistic view of history. Through the ages, men and women have endeavored to come to a grasp of history and the progression of time in several ways. Of these several ways, most of them fit somewhat into two basic patterns: those that view history as a cyclical repetition of events, and those who view time as progressing in a linear fashion. While this appendix to the book is not intended to be a complete explanation of these two concepts of history, they can be summarized as below. events of today are events that have happened before in another life or another age previous to this one. The linear concept of time is more of a western understanding, and is often said to have arisen from Judaism. According to this view, time and history do not move in a cyclical fashion, but had a definite beginning, progresses through the ages, and will come to a definite conclusion. Rather than being represented by a circle with repeating events on the circumference, the linear understanding is represented by a straight line with no repetitions of events, although there may be similarities between events of different ages. of the year as they cycle through time, year after year. We also learn about the water cycle and see a host of other events and properties that fit into this pattern. God has even introduced this understanding of cycles to us as He established the arrangement of the seven-day week, the months, and the years. However, God also shows us that time progresses and does not simply move along endlessly without conclusion. The very first words in the Scriptures are, “In the beginning,” indicating that our existence is not some continuation of an earlier life. Likewise, we learn that all of history is progressing to a conclusion, which, put simply is the “summing up of all things in Christ, things in the heavens and things on earth” (Ephesians 1:10, NASB). With the history that is given to us in the Bible concerning God’s dealings with man, we sometimes see events occurring with a cyclical fashion, but which nevertheless may seem best explained as a linear progression of events. Perhaps the most obvious examples of social cycles are in the time when the Israelites lived under the reign of the various kings. The pattern was one of a Godly nation that, in the passage of time, gradually descended into moral negligence, and then received judgment for their actions before reviving their relationship to God. This cycle is repeated numerous times. However, it was not an endless cycle. God eventually brought the Israelites beyond that era and introduced them to another series of events. Time moved on. It also progressed as if in a lineal fashion. As we study the prophecies of the Bible, we also see both aspects of understanding. Jesus spoke of this when He said, See that no one leads you astray. For many will come in my name, saying, ‘I am the Christ,’ and they will lead many astray. And you will hear of wars and rumors of wars. See that you are not alarmed, for this must take place, but the end is not yet. For nation will rise against nation, and kingdom against kingdom, and there will be famines and earthquakes in various places. All these are but the beginning of the birth pains (Matthew 24:3–8, ESV). that the process of birth has begun, but the actual birth is probably still some time off. There is still time to get to the hospital. However, she does not know for certain each of the phases leading up to the birth, and she must remain vigilant and watchful. 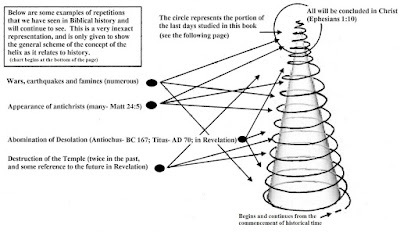 this properly, but I believe we get closer to an accurate understanding if we view history as an ascending and tightening helix. Here we see the cyclical patterns of history, but they are not endless cycles, as we would see in eastern religions and cultures. This is not reincarnation. intense. Indeed, this is what we see in the book of Revelation. Many of the events that we read about in Revelation are things that have happened throughout history, but in the last days, they come around more quickly and become more forceful. 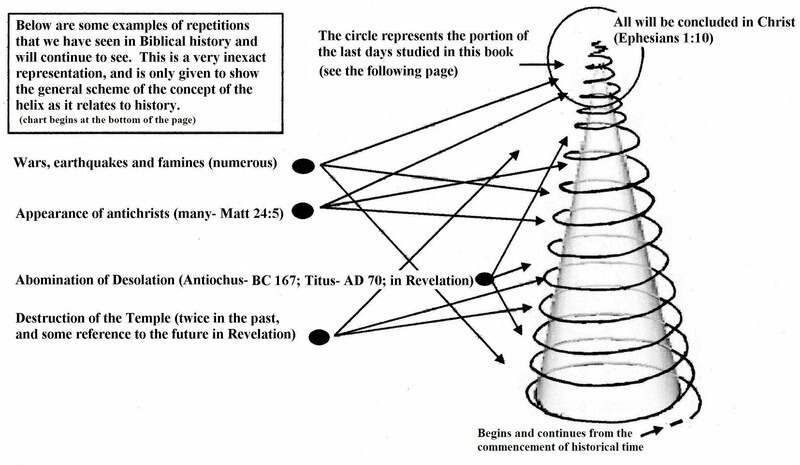 In the Helixical view of history, we see that many events of history seem to repeat themselves, giving time and history an appearance of a repetition of cycles. However, this is only half of the story, since history had a definite beginning and will come to a definite conclusion. In the graphics on this post, we see some of the cycles referred to in the Bible that have happened and will continue to happen until the end. Some of these events are not specific in their timing, since they happen with relative frequency. These are those incidents, such as wars, earthquakes, and famines, that Jesus tells us are not good indicators of where we are historically in relation to the end of time, but only that we can expect them to increase as we get closer to the last days (Matthew 24:4–8). Then there are other events that happen less often, but which also fall into a repeating pattern. These are things such as the destruction of the temple in Jerusalem, which has occurred twice in history, but which also has some reference to the future. Also, there are the appearances of antichrists, which John tells us are many (1 John 2:18). Although there have been many antichrists, relative to this prophecy are also appearances of the “abomination of desolation,” of whom Daniel spoke and who Jesus said would be an indicator of the very last days (Matthew 24:15–22). Daniel also had some very instructive visions that seemed to refer both to world kingdoms of his own time period, but which also will have complete fulfillment in the last days. which Jesus also said He witnessed during His time upon the earth (Luke 10:18). Finally, there are other events that refer particularly to the last days only. These are things such as the series of the seals of Revelation, the trumpets and the bowls. Although they specifically refer to the time of the tribulation, they also have links to past history, in that we have seen some of the events associated with these signs in the past. This is especially evident in the plagues of the last days, which are very reminiscent of the plagues brought on the Egyptians before the time of the exodus. Some of the celestial events that we read about in the book of Revelation also fall under this category. 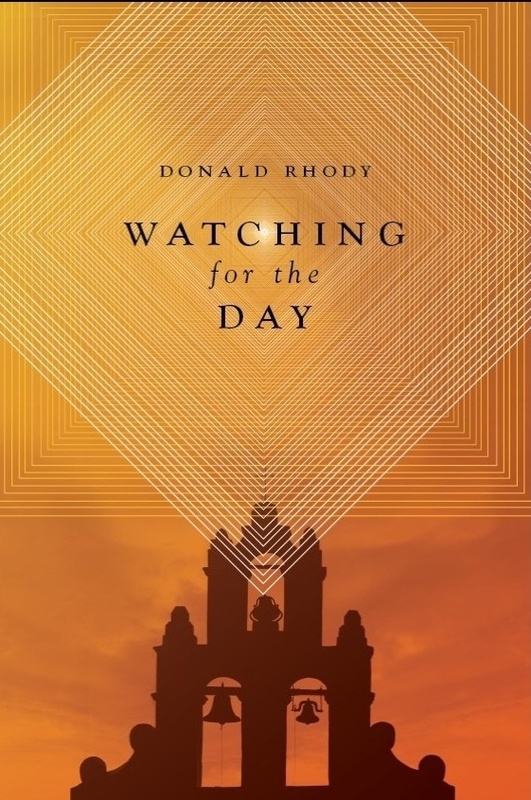 Watching for the Day is my latest book. It has grown out of what I have seen as inconsistencies in many of the prevalent interpretations of Biblical prophecies regarding the last days upon the earth. In my years of studying Scripture, I have noticed that when many theologians and Bible students read the Biblical prophecies regarding the last days, they often already have their minds made up as to how the last days will unfold. Thus, when they read the prophecies, they read into the Bible their own interpretations instead of letting the Bible teach them. I decided to instead take the view of the first disciples of Jesus, when they asked Him, “What is the sign of your coming and of the end of the age?” These disciples did not have any predetermined mindset of what they already thought that they knew. Theirs was an honest question in search of an answer. This book is also asks honest questions and seeks the answers that the Bible gives. The answers that I find may surprise you. They will definitely make you think. Unfortunately, this book is out of print. The publisher who first published this book went out of business. However, I still do have a good number of books in stock. If you write to me at: donaldrhody@gmail.com, I will tell you how you can get one. We know that Paul is not talking about the institutional church, but the church of Jesus Christ. Nevertheless, Vivian and I have lived our lives with the goal to strengthen the local church. In many ways, we have seen this as the nearest thing that we could do to also serve Jesus Christ Himself. 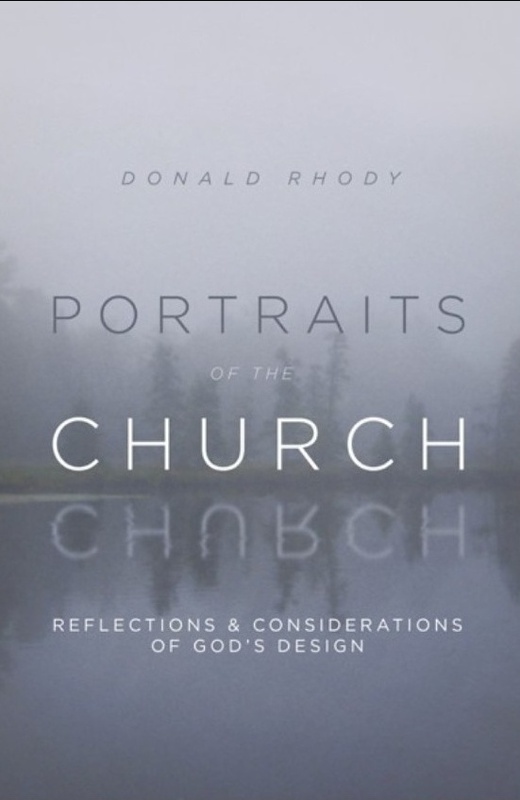 In these present days, many have become so accustomed to pointing out all of the failures and deficiencies in the church that they fail to see that God has invested His whole work in it. We serve the church not because of any loyalties to denomination or creed, but because Jesus Christ Himself has called us to serve His body. If we should concentrate on only criticizing, we fail to see the great promises and future that Jesus has in mind for His church. In Portraits of the Church, I do not ignore deficiencies, but I also explore some of these promises. Surprised by a Garden is a book of short and practical Biblical examples in living. 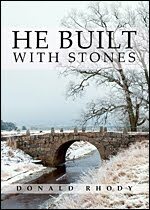 For many years, I have seen Biblical lessons in the things that I have seen and experienced. 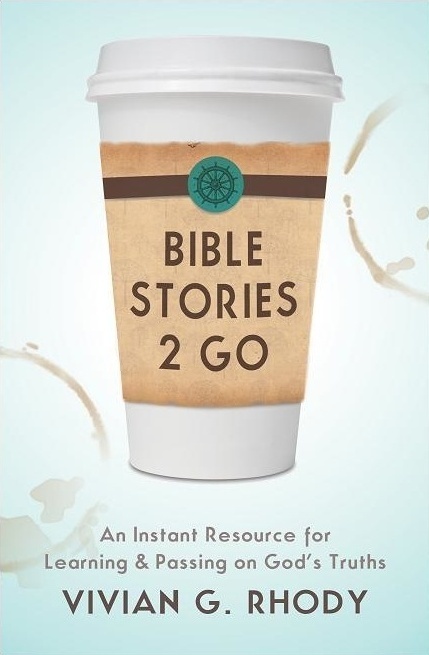 These have become the devotionals in this book. They have come from the experiences that I have had while living and working in various countries of the world. I have learned that if we take time to look, there are evidences of God’s love all around us. This situation is exactly what gave rise to the title of this book. Once, when traveling on an old wreck of a bus over a bumpy and dusty road in India, I finally was able to get off for a few minutes to stretch my legs. Angry at the bus and the road and my whole situation at the time, I decided to take a short walk before I had to get on the bus again. As I walked only a short way off of the dusty road, I happened upon a beautiful garden that someone had planted next to their house. The presence of such beauty in the midst of such filth was revolutionary to me. It helped me to see that there is always encouragement in whatever difficult circumstance we may find ourselves. It has always been astounding to me how firmly many people take unreasonable positions on eternal matters that they do not and cannot understand. The Bible is a book that gives us a glimpse into eternal perspectives and truths. In its pages we can learn much about these truths, but if we are honest with ourselves, we know that in this age, we will never come to a full understanding of them. After all, if our minds cannot even conceive of the concept of eternity, why would we delude ourselves into thinking that we can fully understand the particulars of eternity? 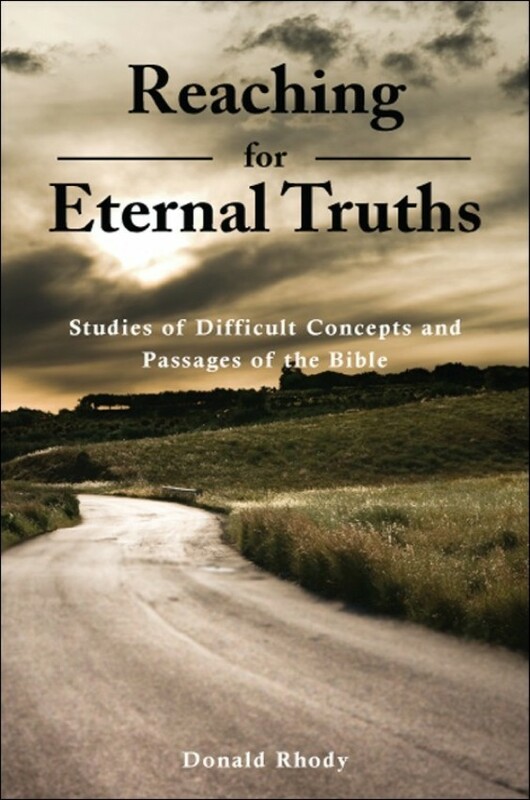 In Reaching for Eternal Truths, I tackle some of the more difficult passages of the Bible; passages such as the relationship between the free will of man and the sovereignty of God and the relationship between grace and works. There are about twenty topics in all. I explore what the Bible teaches about each of these issues, keeping as a focus the authority of the Scriptures to lead us into truth.